The war of words between Greece and the rest of the EU shows no sign of subsiding, despite the agreement to extend the bailout. German Finance Minister Wolfgang Schauble is warning of a possible accidental exit of Greece from the eurozone or ‘Grexident’. 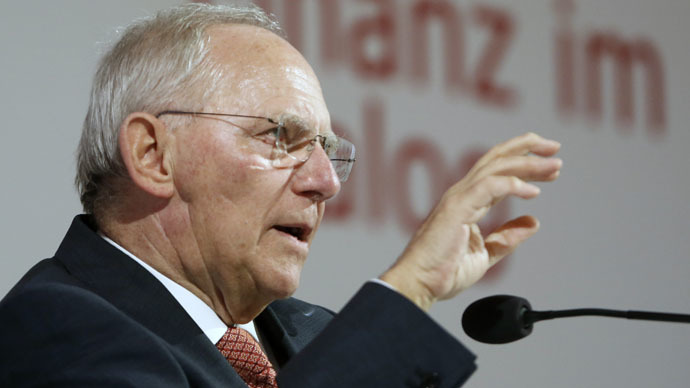 Greece should help itself and implement what it pledged because a ‘Grexident’ is not ruled out, Schauble said on Austrian Television Thursday. While being asked about the possibility of a so-called ‘Grexident’ meaning an accidental series of events which could lead to Greece leaving the euro, the finance minister said the country’s future was down to its authorities and he could not rule out the possibility. Last month Germany, Greece’s key creditor in the so-called troika of lenders, approved Greece’s bailout extension until June. Earlier in the week Schauble said that he was losing patience with Greece, and Athens filed a formal complaint over his insulting remarks. Relations between Berlin and the Athens remain strained. Greece started receiving bailout packages from the troika of international creditors in 2010, with total loans since then worth €246 billion.